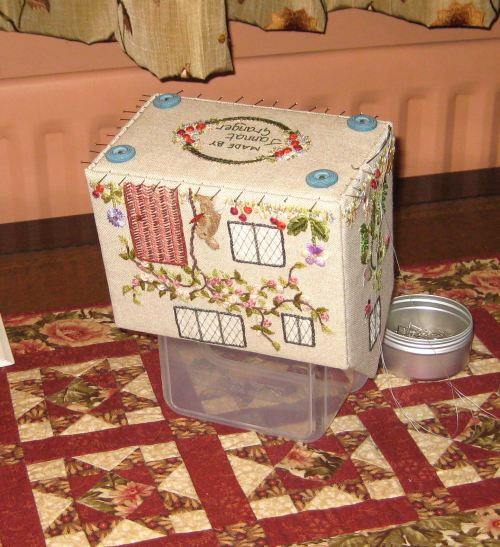 The assembly of the Home Sweet Home workbox by Carolyn Pearce is coming on, now. 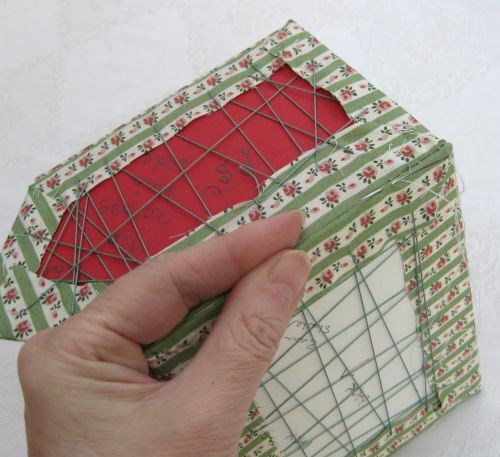 Here’s how I made the lining for the box. First, to be sure of the lining actually fitting inside the box, I taped together the mount board pieces with masking tape, and checked that the shape would easily slide in and out of the main body of the box (allowing room for when the mount board would be covered in fabric, too). 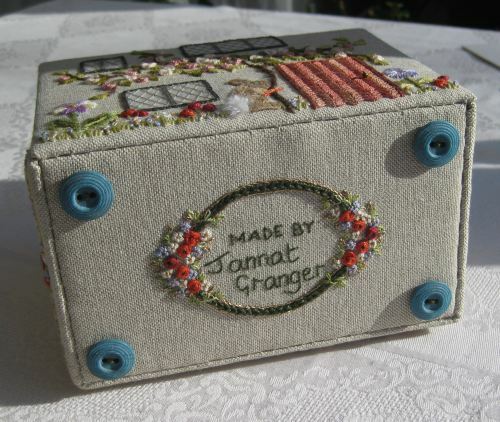 The box lining has risers fixed at the base of each panel, for the inner tray to sit on. 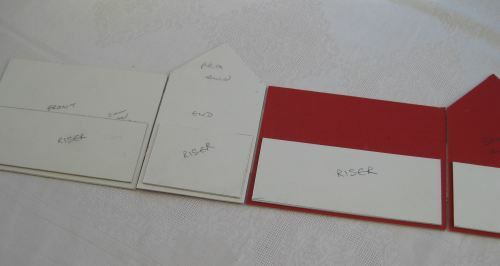 These riser pieces have to be an eighth of an inch in from each edge than the panel they sit on, so that when the panels are in their final position, the risers sit neatly touching each other. So, I made a dry run of that process, too, to make sure everything fitted together, and then labelled each piece. 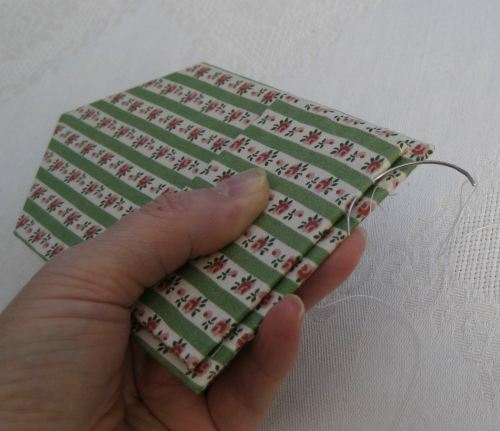 Once I’d laced the lining fabric over each piece of mount board, I positioned the relevant riser on each panel (lining up the stripes, too – a bit of a nightmare!) . 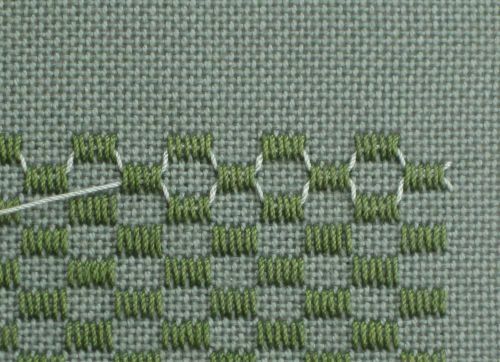 Holding the two pieces tightly, I Ladder stitched around the sides and the bottom edge (but not the upper edge – that is left unstitched). Once the risers had been attached to all four panels, I Ladder stitched the wall linings together, from the outside. 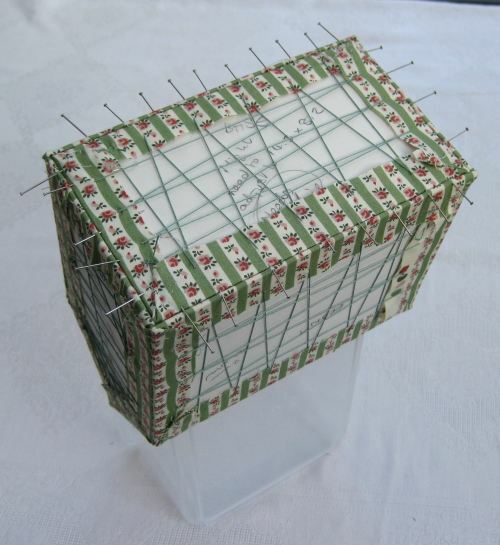 Then I measured the size for the base lining panel, covered the mount board with fabric, and attached it in the same way that I had done with the base of the outer box (using my plastic container to support the box shape on while I stitched, again). None of these pieces were padded with felt first. Next up is making the lining pieces for the roof. 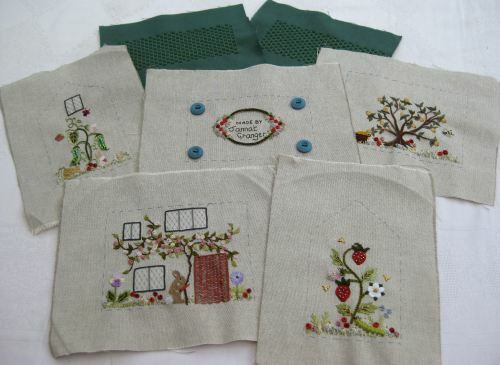 Now that I’ve stitched all the panels for the Home Sweet Home box by Carolyn Pearce itself, I’m ready to start assembling it. 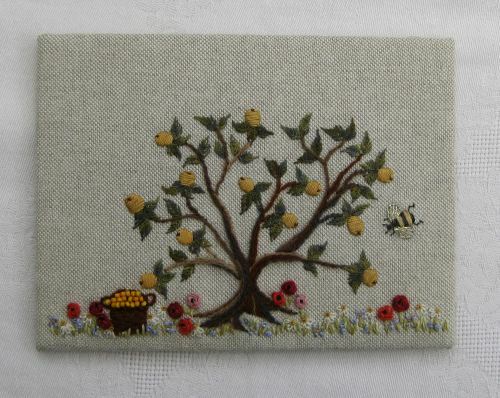 Each embroidered panel needs to be mounted on 2mm mount board, which is padded with felt first. Carolyn suggest gluing the felt on, but I find that using pieces of double-sided sticky tape in the corners of each panel is enough to hold the felt in place. The felt is cut oversized first. 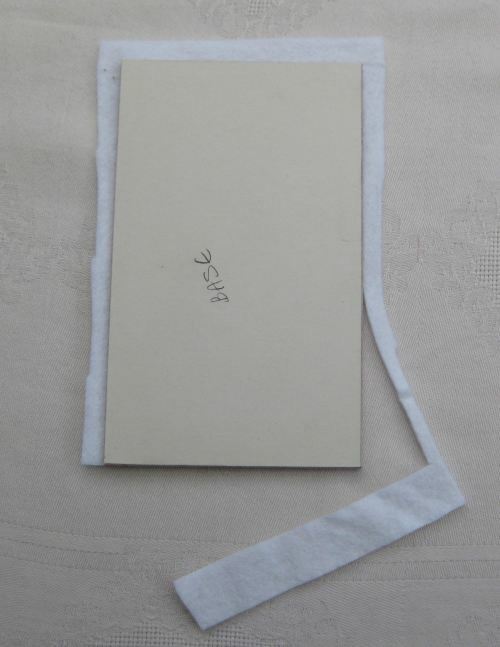 Then, once it’s fixed to the mount board, it is trimmed close to the edge of each piece of board. 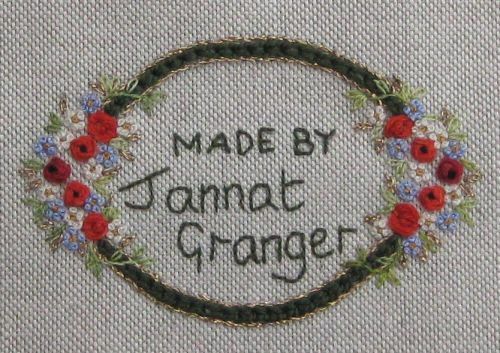 Each embroidered panel can then be laced onto the mount board, using number 12 Perle thread, as that is very strong. 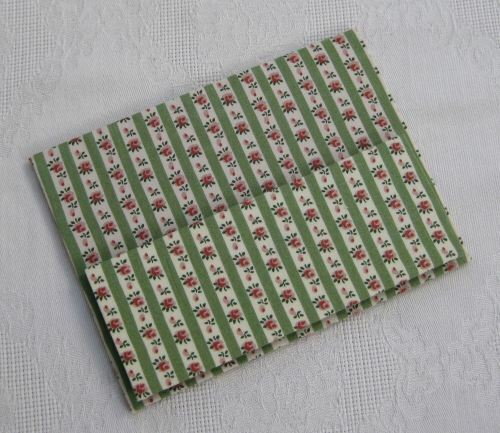 The corners of the fabric are mitred to reduce bulk, using quilting thread. 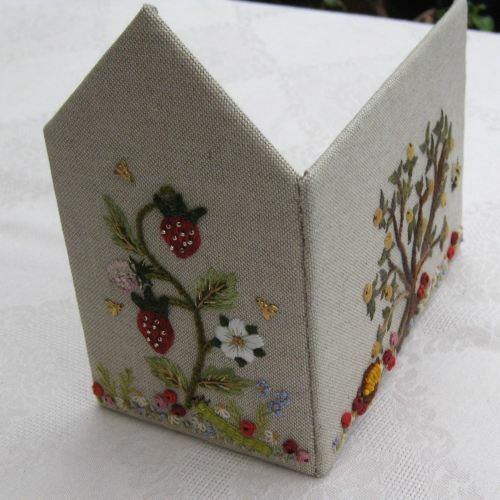 This is the first panel finished, The felt gives a slightly padded look, without it being too much. When all the wall panels are mounted onto the relevant pieces of board, they can be joined together at the edges with strong thread. 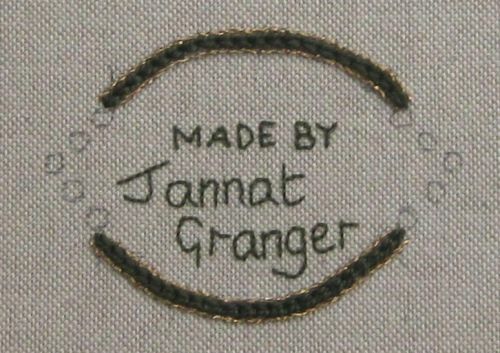 For this, you will need a small curved needle (as used in upholstery), and very strong cotton thread. 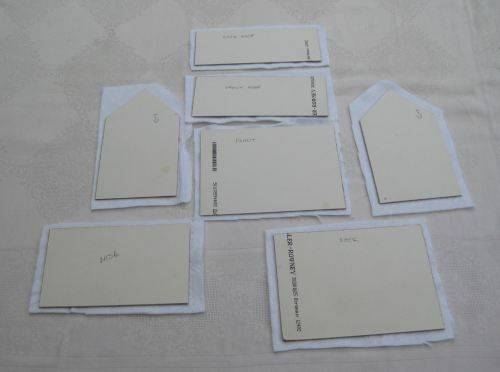 I bought a pack of four in various sizes on Ebay. 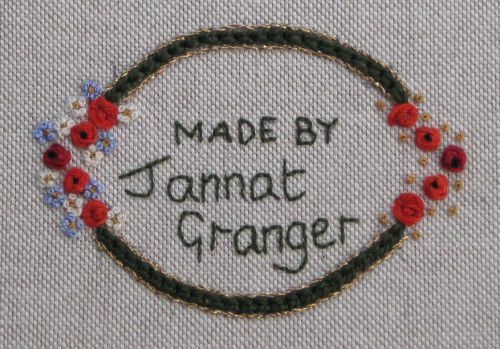 The needle I used was about 1 3/4 inches long in total, along the curve. 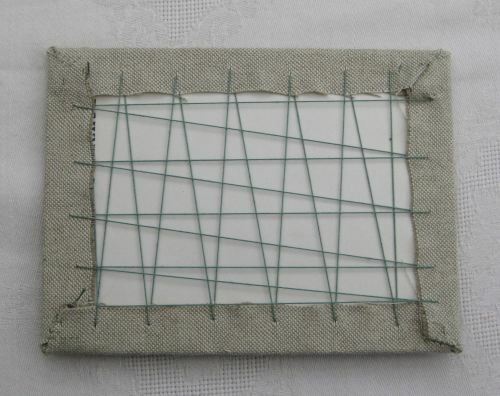 Although it looks, from the image, as if I am stitching away from me, I found it much easier, once I got the hang of it, to always stitch towards me. 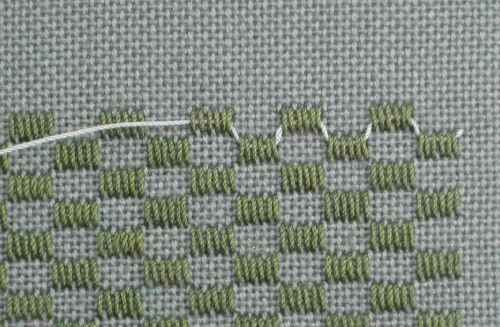 I used Ladder stitch to join the panels – taking a stitch on one panel, then crossing to the other panel directly opposite and making a horizontal stitch there, alternating along the length of the join, pulling the stitches tightly as I went along. 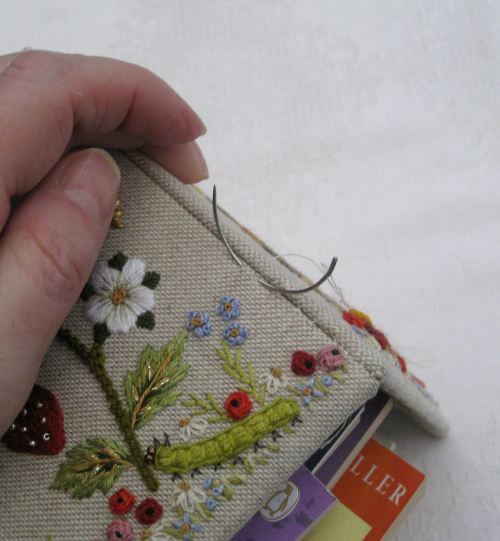 I found it helpful to rest the two panels on a heap of books as I stitched, to hold the panels in place. 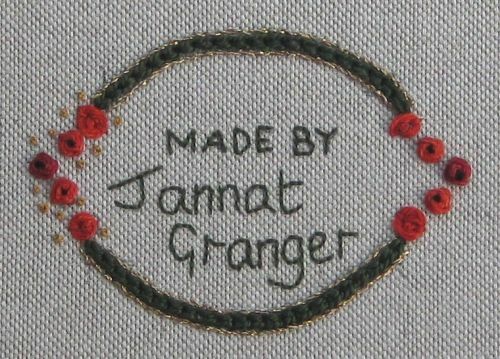 This is the first join completed. When all four walls had been joined, I measured the size of the space where the base panel would fit, before cutting the mount board for that piece and lacing the embroidery to the board. Then I attached the base panel by dropping it into position so that it was flush with the bottom edges of the four walls. Pins inserted in the edges of the fabric held the base panel in position while I Ladder stitched around the base, removing the pins as I went. 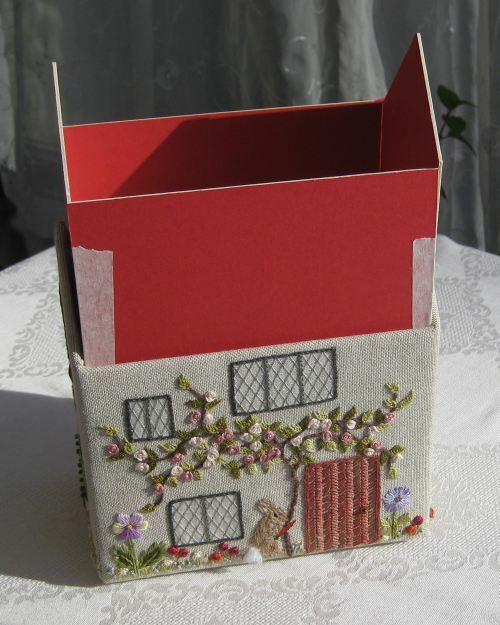 I found it helpful to stand the shell of the house box on a tall plastic food container as I stitched, so that I didn’t inadvertently crush the gable ends while I had the box upside down! 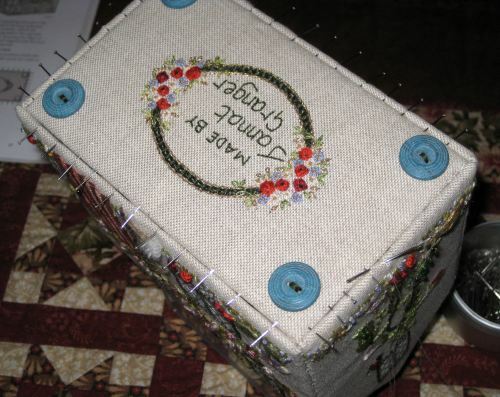 This is the completed outside of the box, showing the base once stitched into position. It only took a couple of evenings to get this far – but that’s the easy bit…….